We’d love your help. 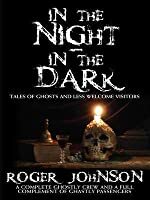 Let us know what’s wrong with this preview of In The Night, In The Dark -Tales of Ghosts and Less Welcome Visitors by Roger Johnson. To ask other readers questions about In The Night, In The Dark -Tales of Ghosts and Less Welcome Visitors, please sign up. a. The Serpent’s Tooth: the beginning of the legend of Frankenstein, in 18th Century. b.	Enigma: a delightful short-short. c.	Desideratum: another great story about bargaining with the devil (or rather, why that’s not such a good idea). d.	Love, Death and the Maiden: a great horror story, justly praised by many, and finally unearthed after it had passed into o-o-p oblivion. e.	“Oddities Investigated” - Tales from a Hero’s Casebook: some of the most “odd” adventures of an occult detective (or, to be more accurate, her beautiful assistant, who always saves the day). f.	A Butcher’s Dozen: Tales in verse: cosmic stuff, just read them once! Roger Johnson's book 'In The Night In The Dark - Tales of Ghosts and Less Welcome Visitors' takes its title,at least in part, from one of my favourite horror movies, The Haunting (1963) directed by the excellent Robert Wise. 'In The Night In The Dark' is a compilation of ghostly and supernatural tales and the book is divided into three sections: 'Things that Go Bump in the Night (tales from the Endeavour)'; 'Things from Beyond'; and 'More Things in Heaven and Earth'. The first section is comprise Roger Johnson's book 'In The Night In The Dark - Tales of Ghosts and Less Welcome Visitors' takes its title,at least in part, from one of my favourite horror movies, The Haunting (1963) directed by the excellent Robert Wise. 'In The Night In The Dark' is a compilation of ghostly and supernatural tales and the book is divided into three sections: 'Things that Go Bump in the Night (tales from the Endeavour)'; 'Things from Beyond'; and 'More Things in Heaven and Earth'. The first section is comprised of ghost stories written in the tradition of M R James, which are a joy to read. They are exquisitely well written and I have found them delightful bedtime reading over the last couple of weeks (my wife thinks I am barking mad to read ghost stories just before I go to sleep!). As with all story compilations I had my favourites of course but they are all beautifully crafted to a very high standard indeed. I devoured all these tales with much glee, although I suppose the stories that really stood out for me were 'The Scarecrow', 'The Wall Painting' and 'The Prize'. The stories are linked by a device whereby people are invited to tell their ghostly tale to a couple of locals in the setting of an old fashioned Essex pub, called The Endeavour. This section was originally published in 2001 as 'A Ghostly Crew: Tales from the Endeavour'. I would have been more than delighted with the book on the strength of this section alone. The book's second section 'Things from Beyond' is based on the writing of H P Lovecraft. I must confess to not being a great Lovecraft fan myself, however, Roger Johnson managed to keep me reading and more importantly kept me interested. The book's final section 'More Things in Heaven and Earth' is a miscellany of various pieces of writing that includes some poetry. This section also includes a chilling tale entitled 'Love, Death and the Maiden' based on the grim and very bloody life history of Countess Elisabeth Bathory, which I thought was truly excellent. It seems a worthy book to be recommending on 31 October!